Home / Cars / ROP / Seen a fatal car crash lately? Seen a fatal car crash lately? Chances are you have. Automotive-related accidents are on the rise. Significantly. This website was recently launched to detail the number of car crashes, recording the fatalities and the injuries, and has current data until the last week of June. Then, unfortunately, it appears the author decided to go on holiday, and no new information has been posted for over a month. One hopes that the author continues with the website, as it is very useful. The statistics, are quite frankly shocking. Below is a table pulled from The Week which shows the rise in deaths and injuries on Oman's roads up until 2008. Unfortunately I do not have access to the monthly data (if anyone knows where to get that from please let me know). The trend is pretty clear, and all recent news reports point to it getting worse. In just the first 44 days of this year, Over 140 people were killed on Oman’s roads, a rise of 16 per cent on the 2008 statistics. And that information is just the first 44 days of the year. And June 2009, was even worse. Again, The Week published data on automotive accidents in this article. 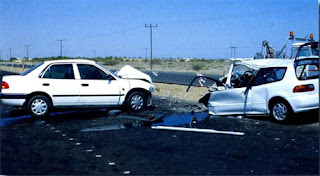 67 people lost their lives, and 817 people injured in a total of 644 car accidents just for June 2009. 77, seventy seven, of these were for run overs. RUN OVERS. What is it going to take to stop people leisurely crossing the highways here? Regularly I see people walking across the highway, UNDERNEATH a pedestrian bridge. Why are these people not being fined for jay-walking? 10,566 new vehicles were registered in June 2009; and 5076 new driving licenses were issued in the same period. We are all aware of Oman's impending huge population boom, Muscat Confidential covered this recently here. New license issues are only going to rise in the future, and the standard of Oman's driving instruction "schools" is appallingly low. The only requirements one apparently needs to be a driving instructor here in the Sultanate are: To be Omani, to have driven for at least 5 years, and to have a car with burgundy red stripes on it. There is no testing body in place to adequately assess the driving capabilities of these instructors. And it's a tough subject to broach too, because, obviously, if an instructor is deemed not up to scratch, then they will effectively loose their method of income until they get up to scratch. And that obviously presents problems in itself. But perhaps something can be done? Perhaps a phased plan to implement minimum testing requirements on driving instructors? Additionally, 135,137 traffic-related offences were recorded for the month. That's a lot of fines, yet interestingly no data was published on licenses revoked for dangerous driving. It is worth noting that the Royal Oman Police document on Traffic Law does have a clear-cut traffic policing outline, it's just not being enforced. So what is being done about this? Not a lot. A few press releases have been printed in the last few months of ROP initiatives and the Oman Road Safety Association have been busy making statements, but nothing seems to be happening yet. Well, I've seen an increase in those portable speed traps being positiond along some roads, which apparently doesnt do anything for the ROP except raise more cash for them, because they are not counting points - as their own document suggests that they do. The number of bald tyres on trucks that I've seen while waiting at red lights; the number of times I've seen people fail to stop at a Stop Sign; fail to yield at a yield (give-way) sign; under-take on a highway; over-take on a solid line; excessively over-speed (read: 15Km/h over the limit); drive at 70 Km/h in the middle lane in a 120 KM/h zone; run red lights; driving with their Niqāb or Burqa on (read the law - this is illegal); driving with black sheets draped across their windscreens and windows. The number of times I see this stuff every week is enough for me to know that the ROP can do more. Why are they not doing more? One significant problem appears to be the issue of Wasta. An ROP officer is less-inclined to hand someone a ticket when they know that person is a local, presumably because their cousin/uncle/brother/etc is in the ROP, or knows someone in the ROP, and they will just have the fine reversed later on. This problem needs to be addressed, at the highest levels of Government, if we're going to be serious about tackling this problem. As Ramadan approaches, everyone please take extra-care on the roads. Statistically more of us are going to die in August and September than in any other month this year. Try to remember that the next time you feel the need for speed, mmmkay? Lead by example, that's the best way. Sythe, this is an excellent post. Thanks for calling attention to the situation. I'm constantly appalled by the driving situation here. The lack of ROP action astoundes me. Take for example 18th November street near the Porshe dealership where the road goes under a flyover and meets up with the Wizarat road. I see accidents there every single day, and know that during Ramadan, it's a constant thing. I actually think there's a guy in orange waiting with a broom and bucket to sweep up all the glass and car parts. Why can't they station an ROP officer there? One who perhaps enforces the no U turns signs posted. It would save a lot of accidents. I know where you mean, I have seen accidents there pretty much every single day since the Chedi R/A was closed. I guess the extra traffic is breeding more lazy drivers doing a U-turn there instead of making a left and then re-joining traffic on a right turn. Good point. Thanks for the link to our Salim and Salimah campaign website www.salimandsalimah.org. The reason for no current death and injury rates is that the ROP website has not been continuously updated since May 10 2005 - we have not yet had a holiday this year!